When decorating your interior space with house plants, you’re not just adding finishing touches to your room, you’re also enhancing the quality of life for everyone who enters it. Choosing the right planter not only adds that finishing touch to your space. It also provides a container in which your plant will grow and live. Choosing the right planter with the right combination of color and design for your décor, as well as the proper size for your plant can result in dramatic results for both your interior space and your plant life. Picking the correct planter is vital to the lifespan and growth rate of your greenery. The planter affects how quickly the soil will dry, the space in which the plant has to grow, the health of the plant’s roots, and how much light is allowed to actually reach the plant. So, as well as needing the right amounts of water and light, the plant requires the perfect planter to provide its foundation for life. Plants need room to grow. However, if you give them too much space, the plant will sit in water too long. This can cause the soil to build up a large supply of nutrients which can negatively affect the plant and ultimately end up causing a nutrient burn. If the plant is crowded into a planter too small, the plant becomes rootbound. This reduces the amount of water the soil is able to hold and ultimately ends up killing the plant. Large rooted plants require deeper pots. Smaller plants require smaller space. If you find your large plant doesn’t fill up the entire space of a large-sized pot, consider planting smaller plants around the base of it to fill up the excessive space. This not only assists your larger plant and also improves the overall look and presentation of your plants and planter. Pick the right location in the room for your planter. For indoor plants, large-scaled planters can easily become a focal point in the room. Be sure to choose a color that is complementary to the pot’s surroundings, whether an indoor space or outdoor location, such as a patio. Be sure to notice if the plant is going to receive the correct amount of sunlight and shade in your intended location. Whether indoor or outdoor, if the plant will receive a lot of sun, the plant will tend to dry out quickly and require frequent watering. Too much shade can stunt the plant’s growth and inhibit the amount of chlorophyll the plant produces, thus lessening the green in the plant’s coloring. Will the plant be moved? Large plants can be tedious to move. If you tend to switch things around in the room or your patio, consider going with two smaller plants rather than one large plant. Go with “the more the merrier” approach. Indoor plants help regulate humidity and have a calming affect on people within the room. Groupings of greenery serve both aesthetic and practical purposes within indoor spaces. Groups of indoor plants can be a stunning display and focal point. Our planters are the solution! 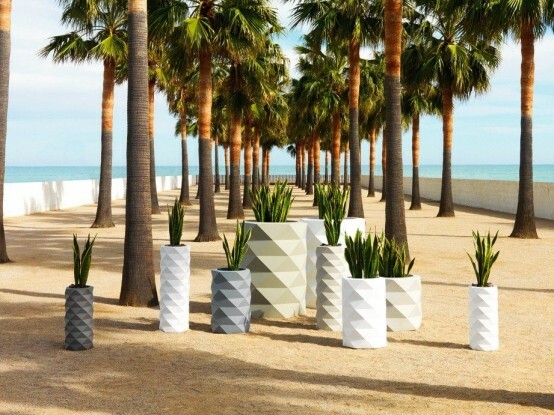 Our fiberglass planters provide the perfect foundation for your plant and your décor. The attractive designs and color-schemes enable you to design that perfect fit for your office, home, or outdoor space – we make choosing the right planter fun! The durable, lightweight resign and stylish construction will provide your plant the perfect home for years to come! Not only will you be thrilled with the presentation, but your plant will thrive in its new home! Most of all you will love the durability our fiberglass planters will offer you and your space. You’ll both be pleased with the results our planters provide!